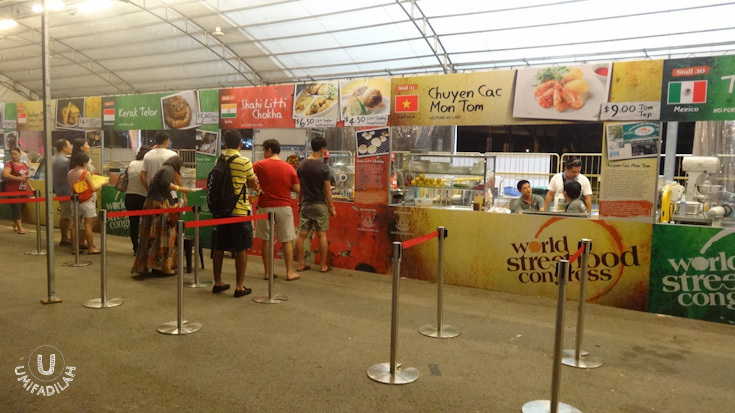 As promised, here's another roundup from World Street Food Congress 2013. Being on a 3D2N trip, I managed to go to the Jamboree twice, at Sunday night and Monday whole day. Located at the F1 Pit Paddock area, WSFC Jamboree occupies a really spacious venue, I must say, that the crowd seems to look more scattered and sprawled. 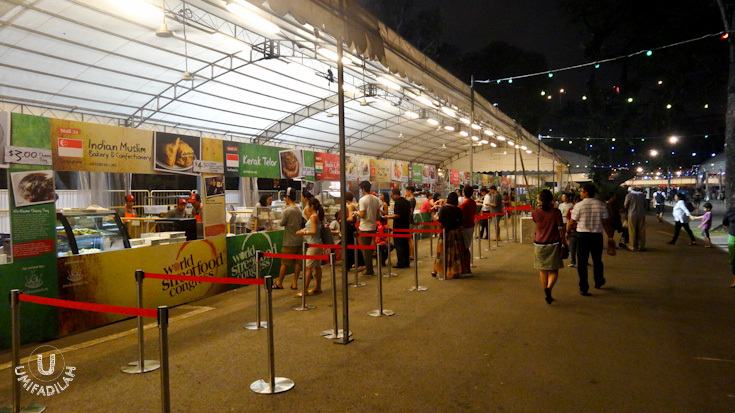 In WSFC 2013 Jamboree feast, there were over 44 different kinds of foods from 37 food stalls from 10 countries: Singapore, Indonesia, Malaysia, Thailand, Vietnam, India, China, United States, Mexico, and Denmark. With 7 out of 37 stalls containing pork, actually it helped me a lot on choosing which stalls to go or not to go first. I really like the fact that the committee put clear information on each stalls, from the history of how that particular street-food became famous on its country of origin, to the clear disclaimer whether the food contains pork/lard, also peanuts for the allergy evaders, etc. Thoughtful! If you were given a chance to fly to anywhere in the world just to eat some particular street-food, where will it be and why? Mexico. And eat Seafood Tostadas at this small seafood cart named La Guerrerense. Which is why, made it to the top of this roundup post. Which became the reason why Seafood Tostadas is the FIRST meal I bought at WSFC 2013 Jamboree feast. YEA DAMN RIGHT IT IS! La Guerrerense tostadas in Ensenada best meal in Baja so far. Incredible. Complex, sophisticated, fresh--and sold from a street cart! Enough said. I trust you, Anthony. Take my money, La Guerrerense! Seafood Tostadas. 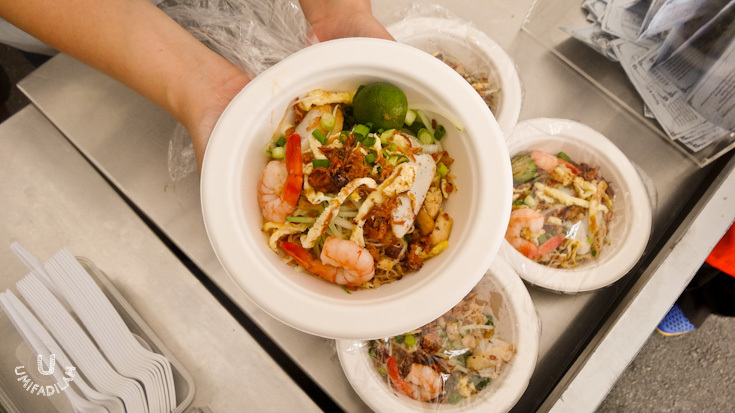 Here at WSFC they sold it for S$10, and apparently they only serve one type of topping consisted of scallop, fresh prawn, super tender octopus, and crab meat. When I saw the video I was drooling with the thought of sea urchin and clams, but I guess I must be satisfied with what I had. WELL, ABSOLUTELY. It was a burst of flavor that have never entered my mouth before! It looks pretty simple but the freshness & the blend of spices really speak for itself. The crunchy flat toasted tortilla, the perfect balance of freshness & acidity, the creaminess from avocado, gorgeous salsa sauce with enough heat to kick your taste buds, I'm out of words. It's genius. Really. Bonus: AND I GET TO MEET SABINA BANDERA HERSELF! Just look at that adorable smile. You just know that you could always trust your meal to her. Through her delicate hands, she composes the perfect balance to tickle your taste buds, giving new sensation that has yet to be found else where. 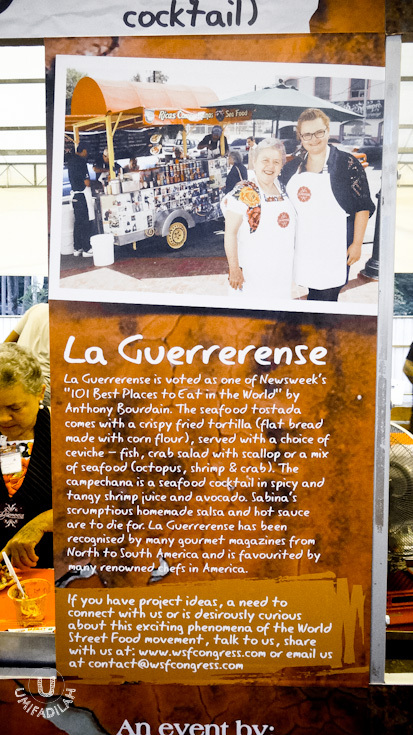 ^TOP: Anthony Bourdain with Sabina Bandera of La Guerrerense at WSFC 2013. Sabina is also titled "Ensenada’s queen of street seafood"! Image taken from @williamwongso's Instagram. Credits to the respective owner. >RIGHT: A little bit of La Guerrerense history on the stall. Other Mexico highlight from WSFC. This time from Tacombi. Famous for their Fish & Beef Tacos (S$10), it was really good! Fried fish & beef with spicy homemade mayonnaise along with fresh red cabbage soaked in light vinegar on top, super refreshing. Love this as some light afternoon snacks. 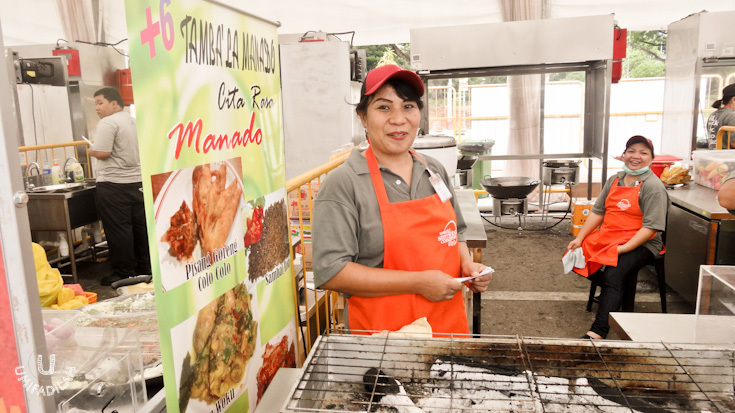 In WSFC 2013, our dear nation was represented by these 5 tenants: Nasi Kapau, Tamba’la Manado, Sate Kuah & Soto Tangkar, Kue Pancong & Kue Pukis, and Kerak Telor (which I didn’t try). Kue Pancong & Kue Pukis was okay, but surely S$4.00 for 4 pieces seemed not that worth it, considering that I could eat as much as I wanted back home here in Jakarta. Sate Kuah, well to be honest the meat was tad a bit dry and tough, although the dipping sauce was good. Now, speaking about Manadonese cuisine, oh boy. Pisang Sambal Roa captivated me easily. 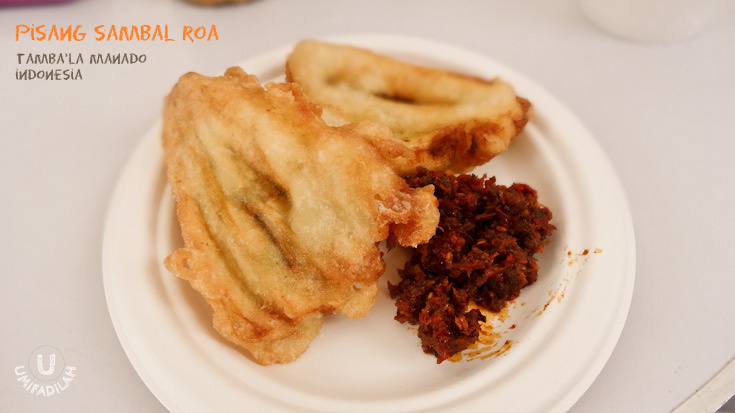 These banana fritters with sambal made of Roa fish were hardly resistible. For first timers it would sound completely weird to mix the flavor of banana versus sambal. Well they use "plaintain" or starchy type of banana that has a more dense texture & mild plain flavor, unlike Cavendish/sweet bananas used for dessert. What’s actually REALLY REALLY GOOD was their smoked fish sambal, Sambal Roa. It gives a strong hint of Roa fish that have been smoked for hours and then crushed and mixed with chili & spices. Works really well. Favorite! Let me tell you the real highlight from Indonesia: Nasi Kapau. Brought to WSFC straight from Kapau, a small town in Agam (a region in West Sumatra near Bukittinggi), from the brilliant hands of Chef Afdal Fitra. And yes, they don’t open a single branch in Jakarta so for me it was a privilege to try such authentic delicacy. It is said that this street food vendor is favorited by the Regent's of Agam. Also, COME ON, ANTHONY BOURDAIN EVEN WAITED IN A LINE FOR THIS VERSION OF NASI KAPAU! A full meal consisted of steamed white rice, beef jerky in bright red sambal (dendeng balado), vegetables & jackfruit core stew, green chili sambal, and probably one of the tastiest Rendang I ever had in my life. Their Rendang also includes "dakak-dakak", the crispy diced cassava chips as you can see above in the picture. It also has an influence of Payakumbuh style, in which it’s really really black and its texture is super dry – as a result from over 12 hours traditional cooking process. For $10 this probably goes to the top of my Worth-to-Buy list at WSFC. I’m a proud Indonesian. I had a chance to try 3 out of 4 Malaysia’s food stall, with the only one being missed was Gurney Drive’s Penang Assam Laksa. Had a bite of their Penang Rojak too but it was too late to take picture (thus the empty plate on the very last image, lol). Also tried Donald & Lily’s Mee Siam, and it was obviously better than what I had back in Kuching few months ago along with my Pontianak Trip. 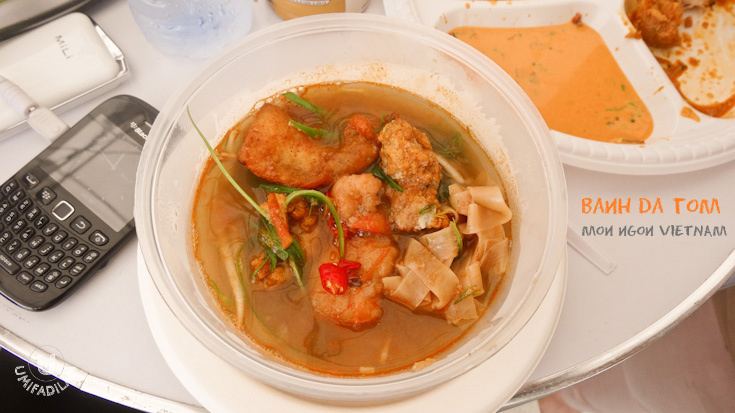 The broth has some leveled-up acidity that gave a strong kick to the whole flavor, but still enjoyable with the abundance of mee, prawns, and fish cake slices. But again, you would want to know the highlight right? Well for me, it was the Big Nyonya’s Nasi Ulam that surprises me the most. I have to admit it was the BEST nasi ulam I’ve ever tried, even what I had here in Indonesia goes straight in shame (or I just haven't found anything quite like it). Big Nyonya’s Nasi Ulam is influenced by Malay-Peranakan style, and they often translated it as Nyonya Herbed Rice Salad, where cold boiled rice mixed with shredded herbs and flavored with lemongrass, kaffir lime leaf, chili, cucumber, and raw string beans. One of the ingredient that was just SO strong (in a positive way), was Kecombrang/bunga Kantan/Honje. OMG it leverages all of the flavor and making the dish sooooo refreshing & delightful. I LOVE IT! But as for their complimentary side dessert, “Chendol”, don’t worry, I strongly think ours is still better. Long live Cendol Elizabeth in Bandung. For S$10 for full meal package of both Nasi Ulam + Chendol, I'd say it's worth to try. 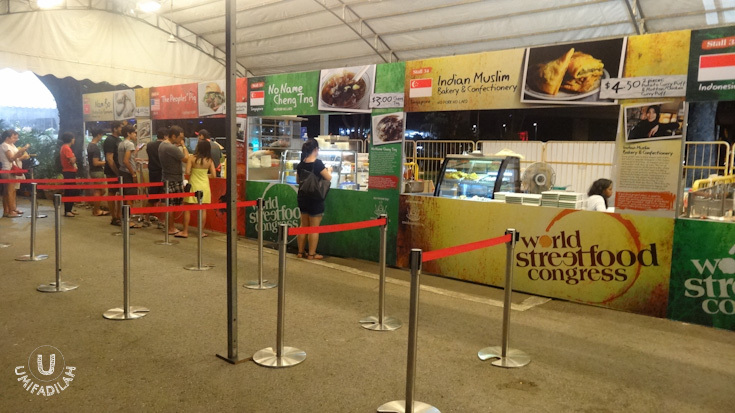 As this year's WSFC Host, Singapore has picked these 6 stalls: Abdhus Salam Indian Rojak, Wee Nam Kee Chicken Rice, Joo Siah Bak Kut Teh, No Name’s Cheng Tng, Indian Muslim Bakery & Confetionary, and Heaven’s Indian Curry. 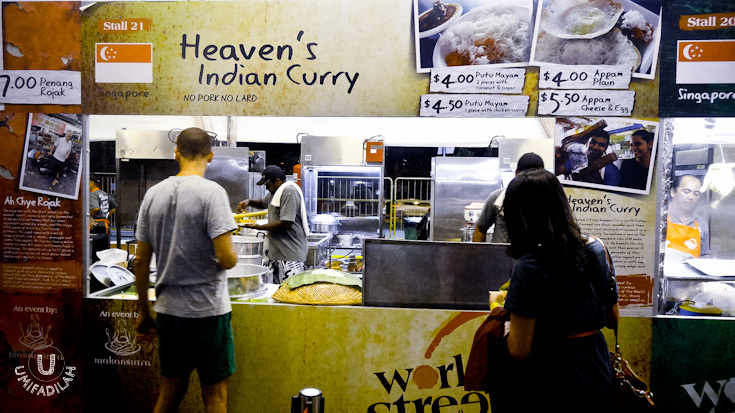 By now you must have noticed that Singapore’s street-foods are mostly influenced by Chinese and Indian flavor. I only had a chance to sample the latter two Indian stalls, Indian Muslim Bakery famous for its Potato, Mutton and Chicken Curry Puffs (you can taste all the herb & spices used to make the base curry fillings, awesome! ); and Heaven’s Indian Curry famous for its Putu Mayang & Appam (which is a bit strange for me because in Indonesia we also have our own version of both with the same name). Turns out that Indian Appam was extraordinary. I tried the non-plain version. The batter were poured into rounded skillet that seemed similar to making Surabi. 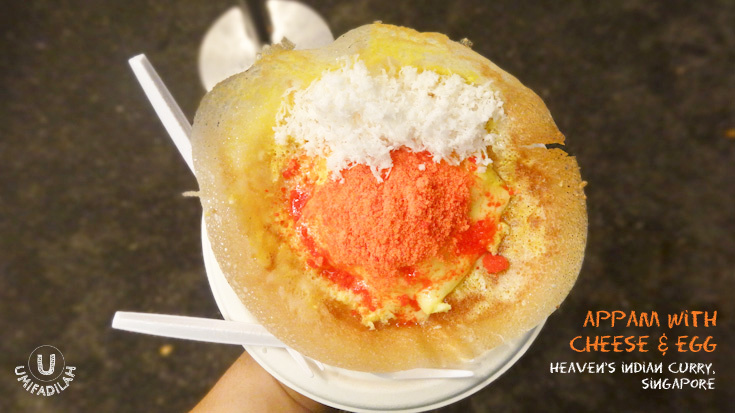 But then they toast an egg to cook along the appam batter, and melt a thick cheese slice. Once it’s thoroughly cooked, the appam is ready to be served with freshly grated coconut and these magical sweet orange sugar (which at first I thought it was another type of cheese powder!). If you have a sweet tooth craving, I’m telling you, that this is just the perfect sweet snack. Can you just imagine a fluffy appam with half-toasted egg and melted cheese, plus sweet hint of sugary powder & salty hint of grated coconut. YUM! India sent out 4 representative food stalls. I kinda regret not trying India Gate Bhelpuri’s Pav Baji & Batata Puri, also the Litti Chokha(s) because we were running out of stomach capacity & food coupons at the same time :p But I’m glad I tried Abhisek’s Chicken 65! IT WAS SO GOOD. AND CHEAP. Definitely the cheapest of all stall, selling it for S$3.5. Some say that 65 refers to the number of days of marination, others say it is the amount of chili peppers that the dish contains, some also says that it was dish No. 65 on the menu of the first restaurant to serve it. 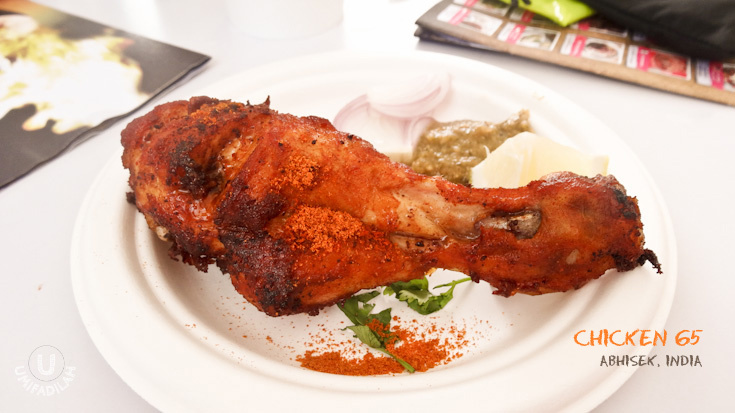 One thing for sure, Chicken 65, a spicy deep-fried chicken from Chennai, is a DIE-DIE-MUST-TRY at the WSFC Jamboree. It comes with a tangy and refreshing mint chutney, which is really great addition to complement the chicken itself. The other Indian stalls that I’ve sampled was Garlic Chicken with Tamarind Rice from Bhaskar Mysore Chamundeshwari Fast Food in India. It comes with two options: tamarind rice or shavige (vermicelli-like thin noodles), so I choose rice instead. The rice & the orange curry broth is warming and fulfilling, but I don’t really dig their garlic chicken. It has this tangy aroma of Indian spices that I couldn’t identify what’s what. Abhisek’s fried chicken tasted better. Finally a western touch despite the Asian food invasion. 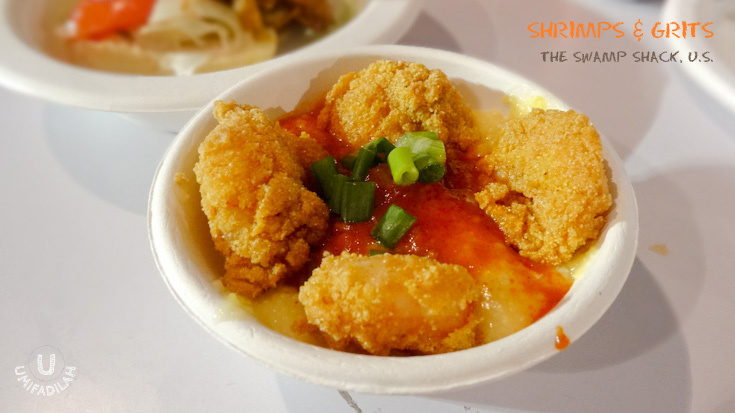 I did my research before I went on this trip, and I swear that I was mostly tempted & intrigued by the name of “Soft Shell Crab Burger” from EuroTrash Food Cart, also “Shrimps & Grits” & “Smothered Chicken” by The Swamp Shack. They also sent out The People’s Pig which is famous for its Porchetta Sandwich, but it wasn’t on my can-eat-list so let’s leave it out. 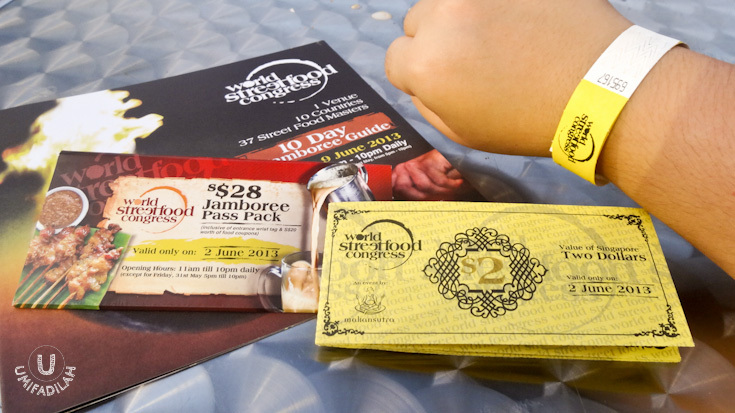 Truth is, I came with such high expectation only to found out that S$12 for a mini-sized burger was just not worth it. True, the deep-fried soft shell crab was superbly crunchy, and if I can munch them as standalone snack that would be really nice. But to be honest, that’s just about it. Nothing special. Spicy mayonnaise, fluffy buns, veggies, and everything you would find on a street-cart burger sellers. I just thought that for $S12 it’s way better to have Wee Nam Kee Chicken rice for only S$5, plus two huge pieces of Chicken 65. Other thing that also made me curious was of course, Swamp Shack’s Shrimps and Grits. Being an Asian who regularly watches Masterchef US, I have constantly been wanting to have a proper meal with grits done right on it :p And this was a lovely meal! I love the crunch of the deep-fried shrimp, and also the grits tasted really really smooth. If only it were less salty, plus, added some cracks of black pepper to add more heat, then it’d be perfect. I can see how it becomes a warming comfort food on a cold weather. I don’t know if I will taste them again in near future (I never heard of any restaurants serving grits here in Jakarta), so I’m really glad I tried it first at WSFC Jamboree. Now, Thailand. Thailand and its street-foods are never to be doubted. Even though I have some real issues on the tongue-twisting names, I never have issues with Thai people’s palate. Unfortunately I only tried 2 out of 4 Thai stalls available at WSFC Jamboree. First one is Hoy Tord Chao Lay, Thai Crispy Mussel and Beansprout Pancake. 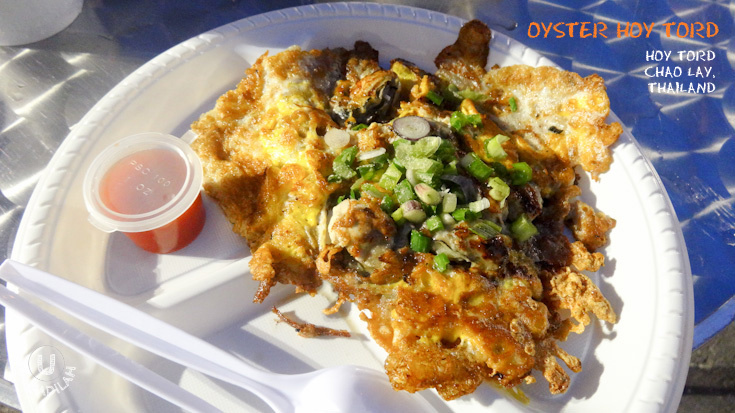 The oysters were super fresh and delicate, works really well along the chili sauce drizzled on top. Together with the crunch of crispy thin pancake and semi-wilted bean sprouts, it was very delicious. I never visited Bangkok before, but when I do, I’m going to look for this original stall somewhere next time! Thank God the Makansutra team has this complete direction on where to find this 40-year hidden gem Hoy Tord seller in Bangkok. Second thing I tried was Kluay Mun Tord. It’s actually fritters of several different kinds for example banana, taro/yam, sweet potato etc. What’s special about these fritters are its coating batter. It’s just different from what we usually have in Indonesia, it’s crunchier, and also the addition of sesame on its batter gives an additional enhancing flavor. Last but not least, Vietnam. They were represented by these 5 food stalls and I TRIED ALL 5 OF THEM. It had just became my favorite country in South East Asia when it comes to street foods, and obviously becoming my future must-visit traveling destination. Let me start with Banh Xeo (crispy seafood pancake) served by Ms Loan's Phan Rang 38. It's a staple street-food of Vietnam, definitely a must-try! And secondly I tried Tom Tep (literally means Prawn & Shrimp), which in WSFC they sold Shrimp with Fried Sticky Rice. 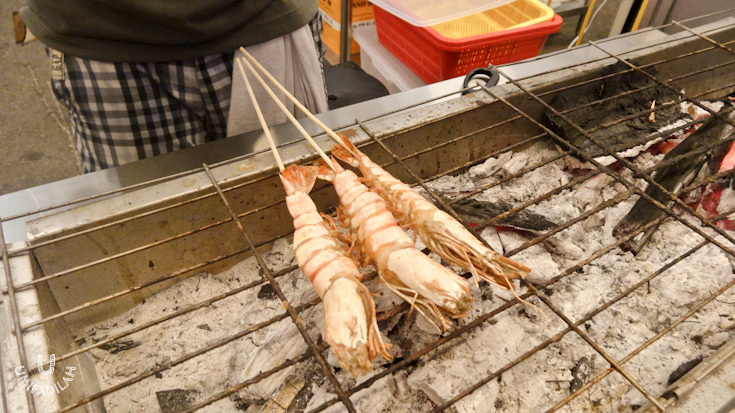 The medium-sized Tiger prawns are first smoked under the sun and grilled over charcoal, then paired with the fried sticky rice which has a crispy outer layer but chewy, soft and fluffy insides. I also tried Spicy red rice noodles with robust shrimp broth called Banh Da Tom. It was served with duo of fried and grilled snakehead fish fillet. The broth was simply amazing! And then finally, the Lion City. 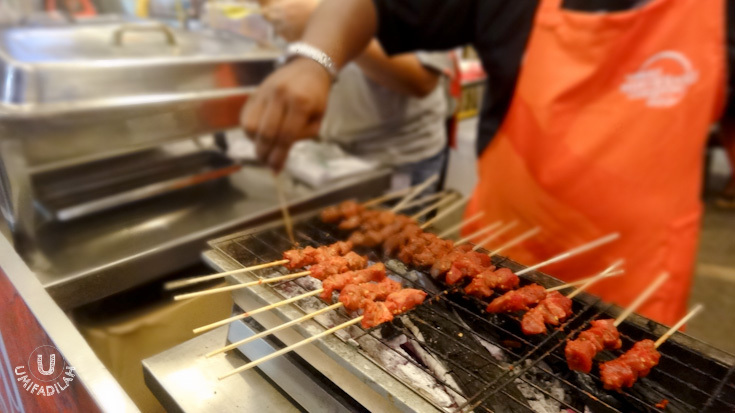 This is actually not a street-food stall, but more like a concept showcase stall because Lion City is the first restaurant in Vietnam that offers authentic Singapore cuisine. Their head chef Panumas Chaisalee won a battle in Iron Chef Vietnam series in 2012. Being a teppanyaki master, he showcases a trio of local signatures, called Seafood Teppanyaki: chili crabs with Mantou bun, BBQ sotong in pineapple sauce and mee goreng. The chili crab was amazing, but not exactly the best one I’ve tried in Singapore, the homeland of the cuisine. But together they complement each other and create fulfilling meal. BEHOLD, THE WINNING DISH OF ALL! It comes from Vietnam. Meet the ingenious, most awesome Chuoi Nuong from Nambo Sticky Rice Banana. It was the BEST thing that entered my mouth, even topped La Guerrerense’s Seafood Tostadas (for me, personally). Or else I wouldn’t have ordered it 4 times during my 2 days WSFC tenure! Chuoi Nuong is basically banana wrapped inside glutinous sticky rice that has been infused with coconut water, and then bundled up on banana leaves. The bundled then grilled over charcoal to create that outer crunch while still keeping the banana inside smooth, and then sliced into five large chunks and being spread wide on a plate for that aesthetic look; before drenched in some thick and creamy coconut sauce along with generous amount of toasted white sesame on top. It was… OH MY GOD. Masterpiece. How do I describe this. It’s a delicate interplay between caramelized melting banana, soft chewy inner of sticky rice, crisp outer of being post-grilled over charcoal, all brought together with the richness of the coconut milk sauce. It brings a whole new level of intensive pleasure that I feel like it deserves a slideshow gallery of its own. “Wait, a wrap already? I thought there were 10 countries?” Yes, I didn’t sampled China & Denmark because all of their dishes contain pork. And Denmark stall which features Porc Sandwich by Klaus Meyer himself (he co-founds “Noma”, what seems to be voted as THE BEST RESTAURANT IN THE WORLD 3 times! Must be some freakin serious sandwich!) hadn’t opened yet until Tuesday 4 June. 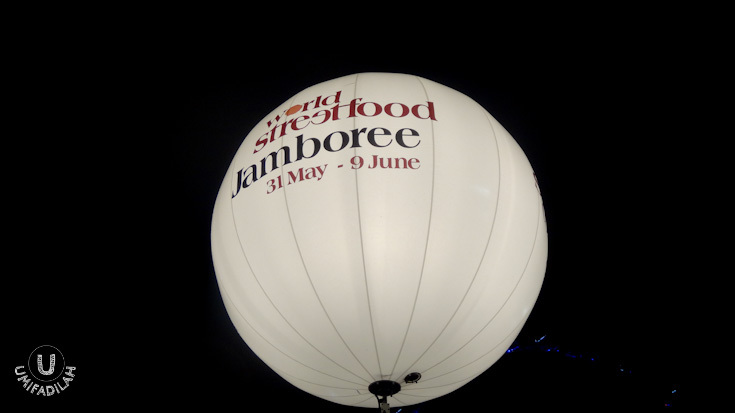 WOULD I GO TO WORLD STREET FOOD CONGRESS 2014? Despite everything, I’d say yes. Yes. Yes. YES. True, that the price did not depict the term ‘street-food’. Street food should be cheap, while all of these foods I’ve tried, was definitely not cheap. 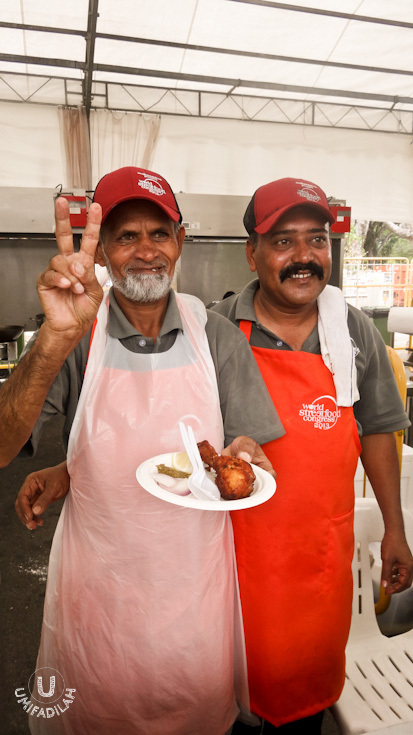 But if you look deeper into the hard work of onboarding all of those the food vendors from all over the world, seeing how they are willing to travel only to bring you a limited experience of truly unique foods from all around the globe, then I’d say it’s worth it. Did you know that Gulab Singh from India Gate Bhel Puri had to walk for almost TWO DAYS just to get him to the local train station to get to Delhi, only for WSFC? Yes. It's the dedication and passion that are just impossible to match and can't be measured with money. Total foodie would know how to appreciate good foods, how they’re carefully produced and handled with care through hereditary recipes from generations to generations, bringing you the maximum pleasure and opening your eyes that there’s so much more things you haven’t taste from cuisine around the globe. And I believe next year will always be better. 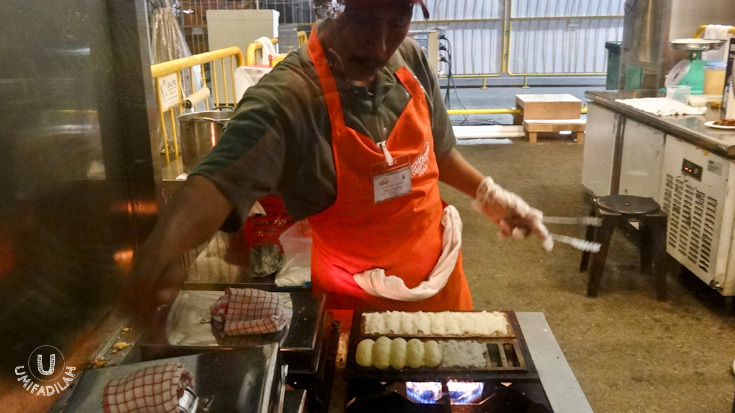 It’s the first ever Street Food Congress and they plan to hold it annually. This year’s was good enough, they’ll learn so much more and know how to do it better. Thanks Makansutra for organizing such great event!